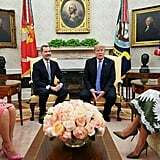 After her recent public reemergence, Melania Trump met with King Felipe VI and Queen Letizia of Spain at the White House, and we couldn't help but wonder . 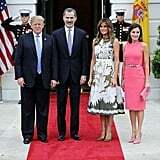 . . have we seen Queen Letizia's dress before? Why, yes, we have. 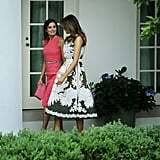 The 45-year-old royal wore a sleeveless pink Michael Kors dress, complete with buttons on the sides, that's the fraternal twin to a certain powder-blue number hanging in Melania's closet. 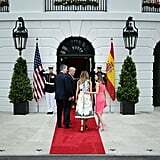 FLOTUS wore the same dress in a different shade last Summer, when she met Panama's president and first lady. 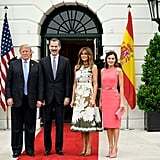 Letizia may have taken a nod from Melania's wardrobe, but she made the outfit her own, not only in her colour choice, but by cinching the waist with a metallic silver belt. Melania opted for an olive green Valentino dress with an ombré effect and matching heels for this visit. 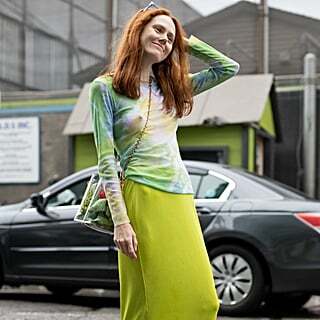 Ahead, take a peek at the duo's meeting and see exactly how they styled their outfits.